I bought this saw on the Milwaukee name. I have owned 5 wormdrive saws by Skillsaw brand name. If I didn't pay so much for this saw I would throw it out. Both handles, guard, and height adjustment do not even come close to the Skill saw. The table is thiner than Skills,it bends very easy. The top handle is I beam shape not round, Hold on to that handle for a day. The guard lever is very thin, if you lay it on the guard lever it will bend. The height adjustment is also about 1/2 the thickness of Skills and it sticks and can be very hard to adjust. Don't buy it! 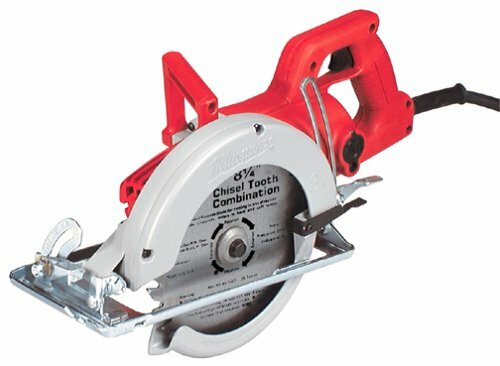 Buy a Skillsaw brand worm drive saw. 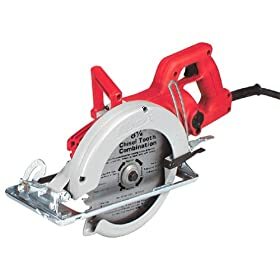 It is only my second circular saw (I am 13) but I think it will be my last saw. It will cut through fresh pressure treated wood with out breaking a sweat. This saw is so quiet that you do not need ear plugs. I own many other Milwaukee tools, I expect high quality from them, and like always, the past with flying colors. You will need some worm drive oil, Milwaukee part # 49-32-0050, and then your set. It will not cut a 4x4 in one pass, but it will cut a 6x6 in two passes. I have to agree with the don't buy it recommendation. I bought it on the Milwaukie name but that name is now tarnished. I have a full shop and about a dozen other milwaukie tools that I really like but this one falls short. Everything in the other review is true. Handles hurt if used for long periods, cheap stamped base plate, my blade came with the print on the back side, the lower guard rubber stop is useless because the lower guard catches at the end where it flares so never gets to the stop. If you can find a shop that carries them, go compare them to the competition. And don't compare the 7 1/4" saws like I did thinking they are representative of the 8 1/4" ones. No box. Good heavy power coord though. Saw was defective. The gear oil was leaking out the shaft. sent it back.